Horseshoe Bend derives its name from its location. 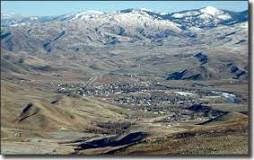 Only 25 miles north of Boise, this city lies on a fertile horseshoe shaped peninsula cut by the scenic Payette River. The Boise National Forest and private rangeland surround the city. With an elevation of 2614 feet and a population of 770, Horseshoe Bend strives to continue its vibrant living and tourism capabilities. Being close to Boise means that people can fly in to a major city and not have to travel too far to enjoy whitewater rafting, kayaking and tubing along he the Payette River. There is an huge array of wildlife viewing, wine tasting an fishing. They have vacation rentals and Roystone Hotsprings 13 miles east on Highway 52. HISTORY: In 1862 prospectors discovered large quantities of placer gold at Grimes Pass. So named by the Grimes and Splawn parties, it is 35 miles east of Horseshoe Bend in the Boise Basin where Grimes was killed by Native Americans while prospecting and was buried at the summit. This led to a gold rush that within the next year brought 16,000 fortune seekers into the Basin. Because of the Boise Basin’s cold winters and deep snows, many miners came out of the mountains to winter in the Horseshoe Bend area and to graze any livestock on the grass covered foothills. Cattle and sheep ranching would later become a major industry in the low lying western foothills of the Boise Basin. Horseshoe Bend’s population remained around 500 during the 1960’s and 1970’s. Subsequently, the population swelled to around 900, where it has remained for the past several years. 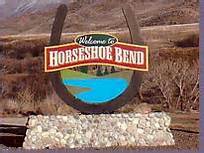 Horseshoe Bend is the largest city in rural Boise County, in the southwestern part of the U.S. state of Idaho. Its population of 770 is the largest in the county.